A lot of people think that search engine optimisation is a grey area, we highlight 5 of the most common SEO Mistakes. It is simply essential in the modern world of Internet Marketing to bring your on page SEO up to scratch. If you are thinking that the good old web developer who built your site, “Must have thought about SEO when he was building it, so it must be OK”. Then I am telling you now Ladies and Gentlemen that this is very far from the truth. Your Web Developer, 9 times out of 10, I can virtually guarantee, is more interested in designing you a wizzy and professional looking site, and the technical aspect of how the site works. He is not interested in whether the site is optimised for SEO. The designers and tech heads that you are trusting leave that to someone else and I can tell you that it is often completely forgotten about! Are you making these seo mistakes on your website? I was talking with a friend of mine who owns an eCommerce business and he was ruing the fact that his website just wasn’t performing very well in search whatever he did. I was actually driving through Manchester so was otherwise distracted. I was trying to find a car parking space up near Kings Street which if you know the city is near damn impossible. And that was it. In one conversation and in the space of 2 minutes I had told him, without sounding smart, smug or clever, exactly what his problem was. I’m not sure that it completely went in but it was a start and he began to do something about it. You see the problem with most platforms upon which websites are built these days is that the default setting is to include every possible variation of a category or product in search. This means that every single variation has to have unique content written for it otherwise it will share descriptive content and Meta from different levels. The answer of course is to either write the 300 words per page of unique content, canonicalize similar content or exclude it from search all together. Example: Marigold Gloves and the Sale page for Marigold Gloves. These variants should be grouped together under the ‘marigold/rubber-gloves’ canonical tag. Unless of course you think that the demand for the sale page is so high that the page warrants a unique title, description and 300 words of unique content! If you just allow them to share the same meta and content then they will both suffer in search. You may wish to group all sale together or all sale gloves but you should speak with your SEO consultant for the best practice, depending on your own content and brand strength. One of the biggest crimes and why so many eCommerce stores find it hard to compete in search is their almost total lack of focus when it comes to keyword goals. If you have created a product category for ‘Rubber Gloves’ and you want that to be the keyword you’d like this page to rank for then stick to that goal. Do not litter the page with other keywords that are not relevant. Sure, use a few variants like ‘Rubber Glove’, ‘Pink Rubber Gloves’ and ‘Rubber Glove Uses’. Avoid littering the page with irrelevant and confusing non-similar variants like Leather Gloves or Sports Gloves. Don’t even mention them unless they are in link form to their respective pages. Do use the Keyword or Phrase in the title of the page, emboldened on the page and as part of H2 or H3 headings. There are so many eCommerce stores on major platforms that do not name their images properly. It is one of the most common seo mistakes out there. If you are selling Rubber Gloves why would you name your images www.yoursite.co.uk/media/1474842770-80169000.jpg – it doesn’t mean anything. Name it www.yoursite.co.uk/media/rubber-gloves. It may seem obvious but it happens all the time. Similarly you must use the Alt tag properly. Google can’t see your image so you need to tell it what the image is. That is why there are Alt tags. So in the above example what better way than to call the image ‘Alt=”Rubber Gloves” or maybe “=Marigold Rubber Gloves”. Make sure that the keyword or phrase is in there, image name and Alt. If you have a page on your website selling Marigold products and lets suppose they sell other products like Hats, Scarves and Wellies. When you link to those products from the respective brand page then use the Keywords for the target pages properly. There is no point using the anchor link ‘Here’ as it adds no link flow to the page whatsoever. There is no point linking to ‘Marigold Rubber Gloves’ with the Keyword ‘Rubber Gloves’ or worse ‘Gloves’ either. You will no doubt have pages that are already targeting ‘Rubber Gloves’ and ‘Gloves’ as single categories. 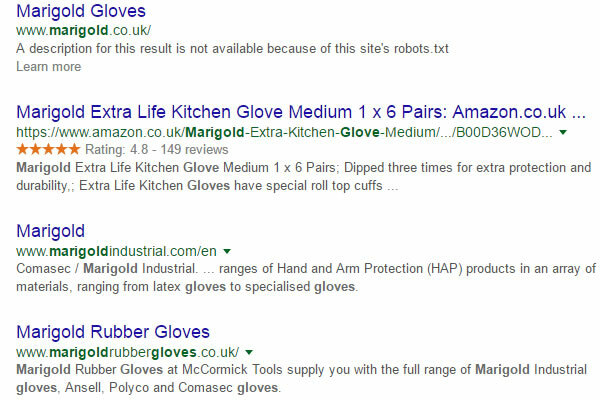 Don’t start confusing the issue by linking through to the ‘Marigold Rubber Gloves’ page with the same keyword. One Keyword – One Page. Otherwise both will drop in search. Your Meta tags are not only useful to search engines to inform them about the content of you page. They are also your only free advert in search. Do you honestly think that a Meta title saying ‘Marigold Gloves | Official Stockist’ is an adequate advert for your shop? Do you think that will drag in the clicks like no-ones business? Would you pay for a 6 ft poster and hang it outside your shop with that written on it? Of course you wouldn’t! Make your Meta count. By all means be careful with the title but say something and keep it under 65 characters. Google doesn’t like superlatives in Google Ads but there is no research to say you can’t tell organic searchers you offer a great range or a great service. This will increase visitors to your site, assuming you are truthful, enhance the customer experience. And how about a compelling Description as well in under 160 characters? This isn’t spam it’s just a shop trying to marketing themselves in the cheeriest, persuasive and mot compelling way. Don’t lie, don’t say you are the cheapest if you are not but give the casual browser an eye catching headline that they feel comfortable clicking on. There are of course other SEO Mistakes that people make but these in my opinion are the most common.